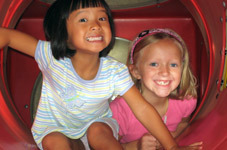 Daycamps include a gymnastics class, craft, outside time and open play. Mid-morning snack will be provided. Madtown Twisters Skill camps are fun, convenient 3 days sessions that offer an excellent introduction to the sport for beginners, and a chance to improve and perfect skills for more experienced gymnasts. Camps will include instruction on the 4 womens olympic events as well as trampoline and tumble-trak. Daily Snack will be provided. Madtown Twister Ninja camps are fun and energy charged! Camp will include Speed, Agility, Strength, Gymnastics, Trampoline and Obstacle Course Training! Daily Snack will be provided.